Haplogroup T is composed of two main branches T1 and T2. The two of them have very different distributions, which are diametrically opposed in most regions. Haplogroup T1 is not found among the Saami, the Jews, or the Avars of the Caucasus, and is extremely rare in Jordan, Morocco, northern Spain, Bosnia and Croatia. The highest frequencies of mtDNA T1 are observed among the Udmurts (15%) of the Volga-Ural region of Russia, followed by Romania (6%) and the southern Balkans (Bulgaria, Macedonia, Albania, all 4.5%), the northern Fertile Crescent (Lebanon, Iraq, eastern Turkey, all around 5.5%), the South Caucasus (Armenia, Georgia, Azerbaijan, 4.5% to 5.5%), then Austria and the Czech Republic (3.5%). Haplogroup T2 peaks among the Udmurts (24%) and the Chechen-Ingush of Daghestan (12.5%). After that T2 is most frequently encountered in the Netherlands (12%), Sardinia (10%), Iceland (10%), Switzerland (9.5%), Hungary (8.5%) and Ukraine (8.5%), as well as among many ethnic groups around the Caucasus such as the Kumyks (10%), Azeri (9.5%) and Georgians (9%). The mutation defining haplogroup T happened some time around 29,000 years ago, probably in the East Mediterranean region. T1 and T2 split from each others some 21,000 years ago, toward the end of the Last Glacial Maximum (c. 26,500 to 19,000 years before present). T2c and T2d developed almost immediately afterwards, followed by T1a, T1b, T2a and T2f circa 17,000 years ago, and T2h 15,000 years ago. The most recent subclades are T2b, T2e and T2g, which date from 10,000 years before present, during the Pre-Pottery Neolithic period. T2b was by far the most successful, accounting for roughly half of all T2 individuals in Europe. T2b is subdivided in 30 basal subclades (+ their own ramifications) to date, twice more than all other T2 subclades combined. Haplogroups T* (perhaps T1a) and T2b have been found in skeletons from late Mesolithic hunter-gatherers respectively from Russia and Sweden. It is the best evidence so far that haplogroup T was present in Europe before the continent was recolonised by Neolithic farmers. However since the samples are contemporary to Neolithic cultures in the rest of Europe, it is not certain that T lineages didn't come through intermarriages between farmers and hunter-gatherers. Pala et al. (2012) suggested that some J and T lineages recolonised Europe from the Near Eastern refugia during the Epipaleolithic, following the end of the last glaciation and the melting of the icecaps covering central and northern Europe. They hypothesise that T1a1, T2a1b, T2b, T2e and T2f1 entered Europe from Anatolia in the Late Glacial period, while T2b and T2e followed in the immediate postglacial period from 11,000 years ago. Many of these lineages would have settled at first in Southeast Europe. They would later have been diffused around Europe by Neolithic agriculturalists after intermingling with the inhabitants of Southeast Europe. The paternal haplogroups corresponding to these lineages might have been E-M78 and J2b, two haplogroups thought to have settled in Southeast Europe in the Late Glacial or immediate postglacial period too. Contacts between tribes of European hunter-gatherers would have allowed T lineages to join Y-haplogroups I1, I2 and R1a during the Mesolithic period. Early Neolithic skeletons (dating from c. 6350 BCE) from north-western Anatolia were tested by Mathieson et al. (2015) and among them were two T2b lineages, which would indicate at first sight that T2b was already present among Near Eastern farmers before they entered Europe. Nevertheless, Lazaridis et al. (2016) analysed dozens of samples from the Pre-Pottery Neolithic sites in Israel, Jordan and Iran and did not find any trace of T2b (although two T1a and one T2c were present in Jordan). Kılınç et al (2016) sequenced nine Pre-Pottery Neolithic genomes (c. 8300 to 6300 BCE) from Central Anatolia, while Fernández et al. (2014) tested 15 mtDNA sequences (6800-6000 BCE) from the PPNB in Syria, but no T2 was found in any of the sites. The complete lack of T2b, or any T2 but one T2c, in the Fertile Crescent during the Early Neolithic period supports Pala et al. 's hypothesis that several T2 lineages would have occupied western Anatolia and south-east Europe during the Mesolithic, and would have consequently have been assimilated by the wave of Neolithic farmers before spreading all over Europe. T1a, however, was found among the very first farmers in the Levant. 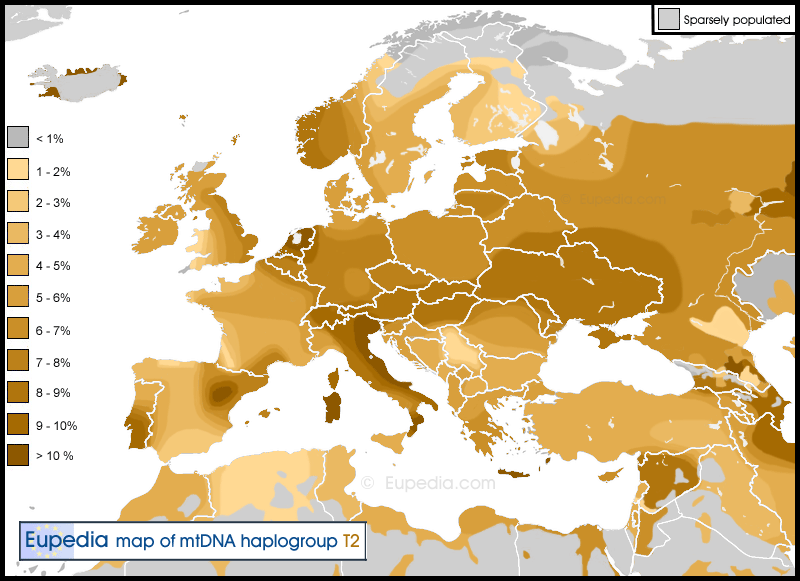 It is certain that haplogroup T played an important role in the diffusion of agriculture across Europe. T samples belonging to T1a1'3, T2a1b1, T2b (including T2b3a and T2b23a), T2c (incl. T2c1d1), T2e and T2f have been found in remains from the Linear Pottery culture (LBK) in Central Europe, and the Cucuteni-Trypillian culture in Ukraine. One T2 sample was also identified at a Cardium Pottery culture site in north-eastern Spain. Wilde et al. (2014) tested mtDNA samples from the Yamna culture, the presumed homeland (or Urheimat) of Proto-Indo-European speakers, and found T2a1b in the Middle Volga region and Bulgaria, and T1a both in central Ukraine and the Middle Volga. The frequency of T1a and T2 in Yamna samples were each 14.5%, a percentage higher than in any country today and only found in similarly high frequencies among the Udmurts of the Volga-Ural region. Haplogroups T1 and T2 were also part of the Bronze Age samples retrieved from the Corded Ware culture (T1a, T1a1'3, T2, T2b2b, T2b4f, T2c) and the Unetice culture (T2b, T2c), both in Central Europe. The Corded Ware culture is associated with the expansion of Y-haplogroup R1a from the northern Russian steppe, while Unetice marks the arrival of R1b lineages around modern Germany. Nonetheless, the maternal lineages recovered in Germany and Switzerland display a strong continuity with Neolithic samples from the same region, and could have been absorbed by the Indo-European male invaders. The only subclades found in Bronze Age Indo-European cultures that have not (yet?) been found in Neolithic Europe are T2b2b and T2b4f. For many mt-haplogroups it is relatively easy to distinguish subclades that were dispersed by the Indo-European migrations during the Bronze Age by looking at the European mtDNA lineages found in Siberia, Central Asia and South Asia, regions that have been settled by the Indo-Europeans during the Bronze Age. The problem with haplogroup T is that all of the top subclades found in Europe (T1a, T2b, T2c, T2e) are also found in these regions. The phylogeny of haplogroup T2 being so complex, in particular downstream of T2b, higher resolution tests are required to identify which deep clades could be of Indo-European origins. Data from outside Europe is still sparse, but among the deeper subclades identified in Central/South Asia were T2b2 (in Turkmenistan, Iran and India), T2b4 (in Uzbekistan), T2b11 (found in the North Caucasus) and T2b16 (found in the Volga-Ural and Kazakhstan). Note that T2b2 and T2b4 happen to be the same subclades as those recovered from Corded Ware remains. As a result, there are high chances that these two subclades were found among the Bronze Age Proto-Indo-Europeans, particularly with Y-haplogroup R1a (associated with the Balto-Slavic and Indo-Iranian branches). T2a1b1 was found by Keyser et al. (2009) in Bronze Age samples related to the Andronovo culture from the Krasnoyarsk area in southern Siberia. The male samples tested from the same site belonged R1a. Interestingly, T2a1b was also found at a Bronze Age site in the Harz mountains in central Germany, described by Brandt et al. (2013) as a Bell Beaker site, but which is more likely a late Corded Ware or early Unetice site. Nowadays, T2a1b is found mostly in eastern, central and Mediterranean Europe, but has also been found in the British Isles, Scandinavia, the Caucasus, Kazakhstan, Iran, Turkey, Palestine, Egypt and Yemen. According to Pala et al., it is one of the T subclades that penetrated into Europe during the Late Glacial period. It could consequently have belonged to tribes of hunter-gatherers who migrated to Northeast Europe and mixed with R1a populations there. Several millennia later it would have been carried to Central Asia, then Iran and the Near East by the Indo-Iranian R1a-Z93 invaders. Regarding T1, the only deep clade that could been linked to the Indo-European migrations is T1a1a and its subclade T1a1a1, which Pala et al estimate to be respectively 11,000 years old and 6,800 years old. The latter represents as much as 70% of all T1 lineages and its timeframe fits perfectly with a Bronze Age expansion. Furthermore, T1a1a1 is particularly common in countries with high levels of Y-haplogroup R1a, such as Central and Northeast Europe, but also everywhere in Central Asia and deep into North Asia, as far east as Mongolia. Subclades that evolved in the Near East and have remained more frequent there include several T1a subclades, T1b, T2a, T2c, T2d and T2h, among others. Note that the depth of the phylogenetic tree has been reduced to four subclades downstream of T* (except for T1a1a) to facilitate its reading. According to Chinnery et al. (2007) and González et al. (2012), haplogroup T appears to be protective against type 2 diabetes. Studies by Stanger et al. (2007) and Kofler et al. (2009) both found that coronary artery disease was significantly more prevalent among patients belonging to haplogroup T.
The common C150T mutation has been found at strikingly higher frequency among Chinese and Italian centenarians and may be advantageous for longevity and resistance to stress according to Chen et al. (2012). C150T defines haplogroups T2b9, T2c1c1 and T2e, but may also be found among other subclades. Ruiz-Pesini et al. (2000) reported that men belonging to haplogroup T have the highest risk of asthenozoospermia (reduced sperm motility). A study conducted by Castro et al. (2007) found that mtDNA haplogroup T is negatively associated with elite endurance athletic status. However, a more detailed study by Maruszak et al. (2014) analysed the mtDNA of 395 elite Polish athletes (213 endurance athletes and 182 power athletes) and 413 sedentary controls, found that members of haplogroup T were as common among athletes as in the control group. The authors of the same study identified two polymorphisms associated with achieving the elite performance level: 16080G and 16362C. The latter defines the T1a13, T2b16 and T2i clades, which therefore may have increased athletic predispositions. Another study by Murakami et al. (2002) reported three other polymorphisms associated with increased VO2max and athletic performance (especially for endurance). These were 199C (found in T2b3d), 16298C (found in T2f1a) and 16325C (found in T1a1m, T1a8a and T3). Ivanov et al. (1996) sequenced the mitochondrial DNA of Grand Duke of Russia Georgij Romanov in order to establish the authenticity of the remains of his brother, Tsar Nicholas II of Russia. They also compared the sequence to that of twi living matrilineal relatives. The mtDNA all matched and fitted into haplogroup T2 (with heteroplasmy at position 16169). 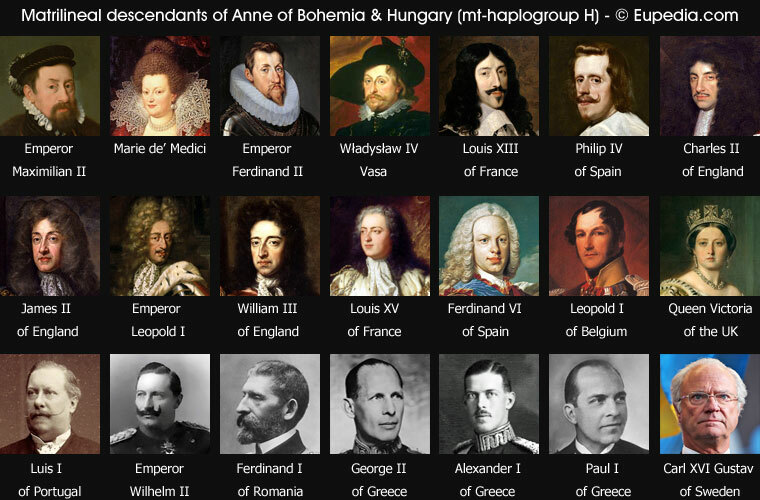 Retracing the matrilineal genealogy of Nicholas II leads to Elizabeth of Luxembourg (1409-1442), Queen of Germany, Hungary and Bohemia, and daughter of Holy Roman Emperor Sigismund. Her female-line descendants include a great number of European nobles, such as Charles I of England, George I, George III and George V of Great Britain, Frederick William I of Prussia, Charles X Gustav of Sweden, Gustavus Adolphus of Sweden, Maurice of Nassau, Prince of Orange, Olav V of Norway, and George I of Greece. Stone et al. (2001) analysed the presumptive remains of Jesse James (1847-1882), the famous American outlaw, gang leader, bank robber, train robber from the US state of Missouri. He was the most famous member of the James-Younger Gang. Already a celebrity when he was alive, he became a legendary figure of the Wild West after his death. Jesse James's remains were compared against two maternal relatives and all were found to belong to mt-haplogroup T2. Henry Louis Gates (subclade T2b2): an American literary critic, educator, scholar, writer, and editor. He was the first African American to receive the Andrew W. Mellon Foundation Fellowship. He has received numerous honorary degrees and awards for his teaching, research, and development of academic institutions to study black culture. He has hosted two PBS television series analysing the genetic genealogy of American celebrities: Faces of America and Finding Your Roots. Eddie Izzard (subclade T2f1a1): an English stand-up comedian, actor and writer.